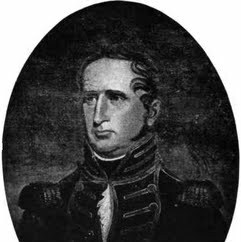 Commodore Arthur Sinclair was an early American naval hero, who served in the U.S. Navy during the Quasi-War with France, the First Barbary War and in the War of 1812. His three sons also served in the Navy; they resigned in 1861, however, to serve in the Confederate Navy. Sinclair was the great-grandfather of novelist Upton Sinclair, author of the novel The Jungle.